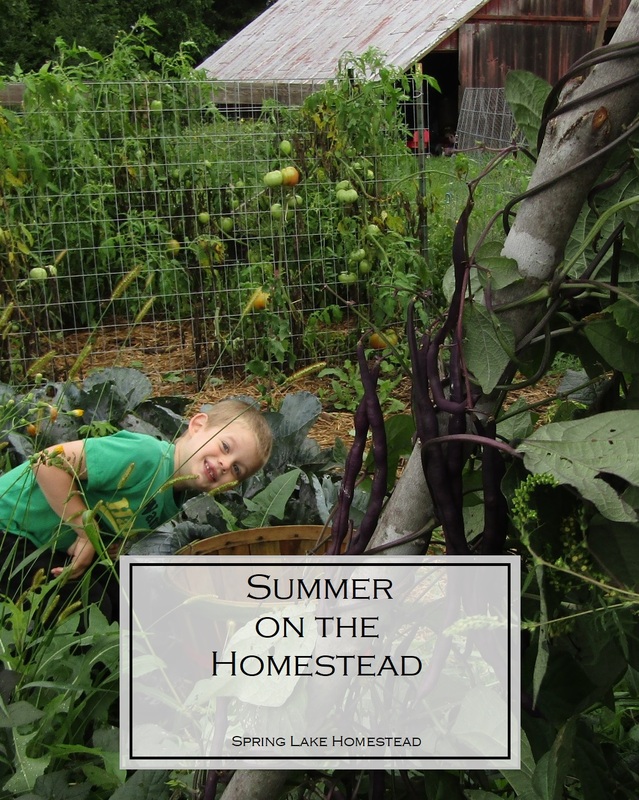 Summer on the homestead is not over despite the fact that fall decorations are all over the stores and kids are done with summer vacation. The last month of summer is by far the most intense month of the year for us. 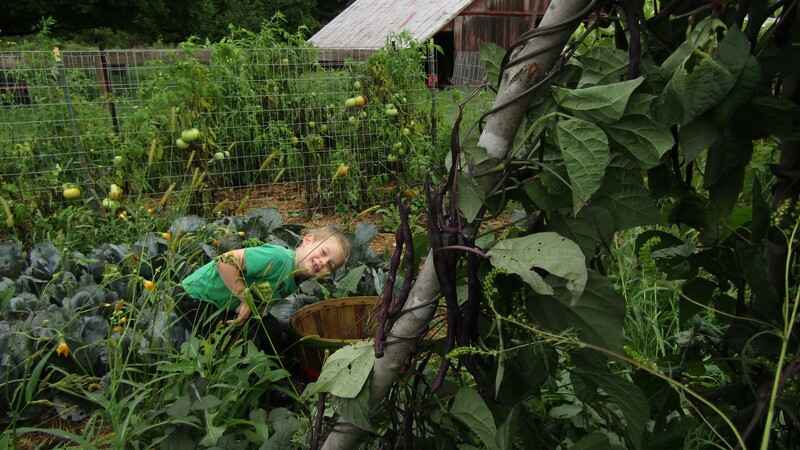 September is spent harvesting, preserving, and cleaning out the garden as we go. On top of that, this is the time of year we start thinking about butchering. There are still lots of projects to wrap up and yard work to complete before the summer is gone and freezing temperatures begin to creep in. One thing I can say about this summer is that it’s been nothing short of exhausting. I wish I had done a better job of blogging about what’s been going on this summer. But I think I have some good excuses…this summer has really taken it out of me, and I’m only first starting to regain my energy now. And thank goodness too, because I need it to get all of our harvesting and preservation done! My energy was really zapped by three things throughout the summer: 1) The fire (well, that and my knee). 2) The humidity… it was beastly hot and horribly sticky. 3) Pregnancy! Yes, that’s right! I’m pregnant with number six. Just over 15 weeks. I mentioned it in passing in a recent post, but we haven’t really said too much about it just yet. Consider this my official announcement 🙂 But the exhaustion that inevitably comes along with pregnancy, and the morning sickness mixed with the humidity left me drained. It was a mentally, physically exhausting summer, but still, it’s been pretty good. June shaped up to be a pretty good month. Right around the middle of the month, things started to turn around for us. With a bit of help from the kids and my sister-in-law, I was able to get our garden planted. I wasn’t able to clean up everything that I wanted, and I ended up not planting a few things that were originally part of my plan because it just wasn’t in the cards. Despite the fact that I was unable to plant everything, we ended up planting more this year than ever before, and with better results than ever before! The new birds came June 16th. We ended up loosing the 4 turkeys due to a newbie mistake on my part (note to self… do not put turkey chicks in a brood box with ducklings. Ducklings are clumsy and grow fast, and turkeys are fragile!) As for the chicks and the ducks, they are mostly doing well, though we lost several bunches of chicks from trampling. They crowded during the thunderstorms. Then we lost a few at random during the hottest part of July, I would suspect from the heat. We lost one of the ducks during that time. We still have 3, but are probably going to give one of them to my brother since they lost one of their ducks earlier this summer and now they just have the one. Oh, and just recently, we added two roosters to our flock of chickens! Thanks to a homeschooling friends, we’ve added two Cream Crested Legbars to our flock. They are adapting well! (Thank you!) She actually brought 5 to us, but agreed to butcher two of them for her and give one away to my brother. The first day we had them, I made the mistake of not getting them in a coop fast enough and “homing” them and they spent the first two nights up in our sugar maple. Everybody’s favorite duck. They just love her “hair-do”! The mixed flock… the hens from this winter (that we got as grown hens to replace the ones we lost to a raccoon in February), the chicks we ordered after the fire, the ducks, and the new roosters. The new roosters, just hanging out in the maple tree. Around Father’s Day is when we found out we are expecting again, and then about a week later we had Miss Lady’s 4th Annual Tea Party (I really need to write about that soon). July started with our Independence Day party, and after that, the heat got really bad. Just about everybody in our area hid out and only went outside when it was absolutely necessary. That’s about the point that I stopped tending to the garden regularly. I weeded once, really well before the 4th, and since then I’ve only made it in there a handful of times to weed small areas here and there. There is still a massive area at the back of the garden that needs to be weeded and worked hard by the chickens this fall. 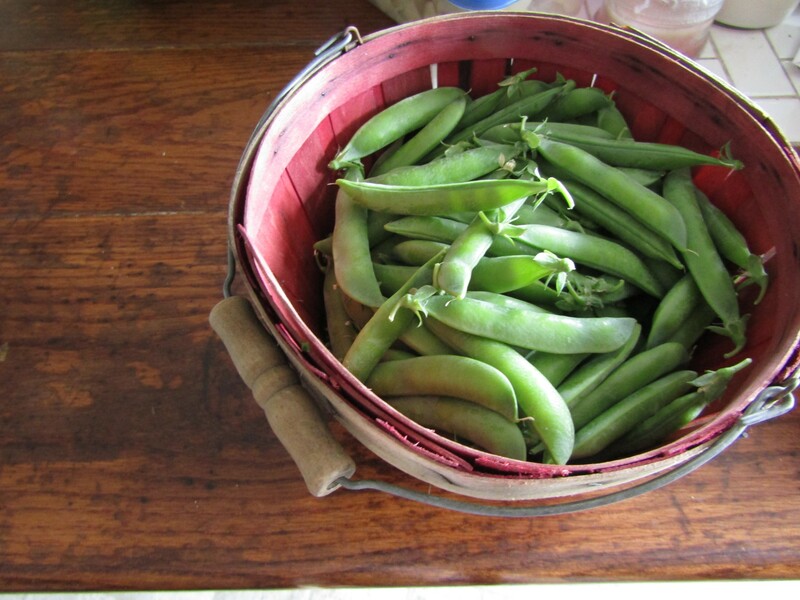 In July, we were harvesting lettuce and peas. In total, I think we ended up with about 6 cups of peas. It would have been more, but with the morning sickness, I just didn’t make it out to the garden often enough to pick the last of them, and I couldn’t convince the kids to get out there and pick them because the mosquitoes were so bad. Around mid-to-late July, I picked our cherries and made cherry syrup for putting on ice cream and into white sodas (along with other things). Any other berries we picked almost all went right into the kids’ mouths. This was definitely our best berry year, and I’d expect that in the next year or two, we’ll actually start being able to preserve some. At the end of the month, the kids and I planted their fall gardens, which are doing pretty well so far. It looks like they just might be successful, but what will really determine how successful they are is when we end up getting our actual first frost. The older two boys harvested two massive zucchini which were turned into “zapple pie” (mock apple pie) and zucchini gummy candy. Actually, we ended up mostly following our own recipe for Apple Crunch Pie instead of the Zapple pie recipe (with the exception of how we cooked the zucchini before putting it in the pie), and it turned out really good! (If I remember, I’ll share a post for our version of “Zapple Pie” sometime soon. Aaron and Adam holding their mammoth zucchini. They were VERY proud to have grown these themselves! The last week of July, I decided it was the right time to replace the seal under the toilet since I knew it had been leaking and recently bought a new seal (not a wax one… the salesman talked me into getting the good one, and I have to say, I think it was worth it). 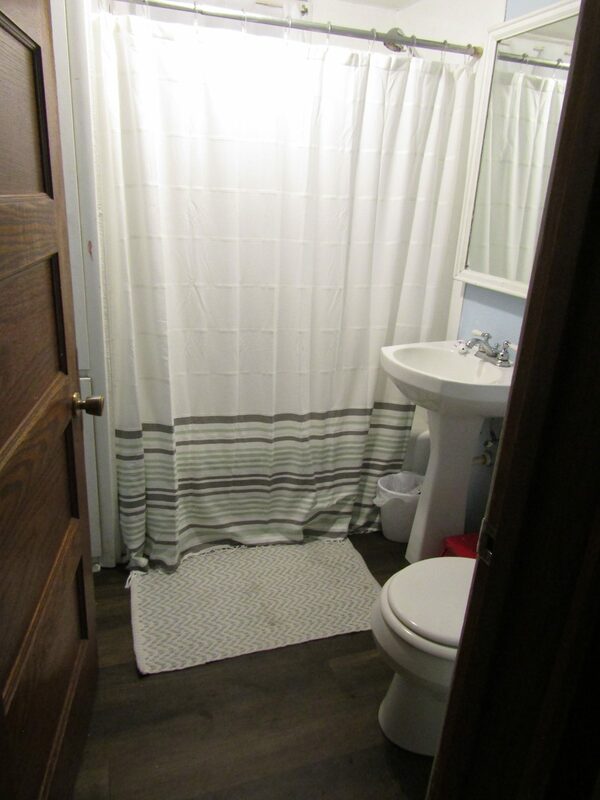 But when I pulled the toilet off and started cleaning up where the old seal had been, I discovered a bigger problem than anticipated, some of the linoleum and layers of subflooring underneath the toilet were beginning to rot and really did need to be replaced before putting the toilet back into place. What was supposed to be a 15 minute job ended up taking me about 6.5 hours. It was a real push to get the job done, because we had company coming that evening and it HAD to get done before they got there… lesson learned! DON’T do toilet repairs the day you have company coming over!!! Do it days ahead of time, or wait until after if it isn’t something that prevents the toilet from working. Well, the flooring project turned into a very slow “bathroom renovation” project. Basically, it involves me replastering our bathroom walls, and eventually painting and putting in new trim. I hated the texture of our walls (it made it very difficult to clean the walls well… a must when you have a lot of kids), and the trim that was in the room wasn’t going to fit back in place properly. I’m hoping to find the time and energy to finish up that project soon! I’m guessing we’ve harvested at least 20 zucchini, and at this point, about 15 gallons of tomatoes. Somewhere around 15 personal watermelon, 15-20 lbs. of potatoes, a handful of piddly little carrots, a sad amount of small onions (both the carrots and onions got too weedy), and we canned 49 quarts of green beans. In just one day, we harvested about 10 green bell peppers which I diced and froze, totaling about 1/2 gal. of peppers so far. There have been a handful of jalepenos, but most of our pepper plants just haven’t put out much for fruit. 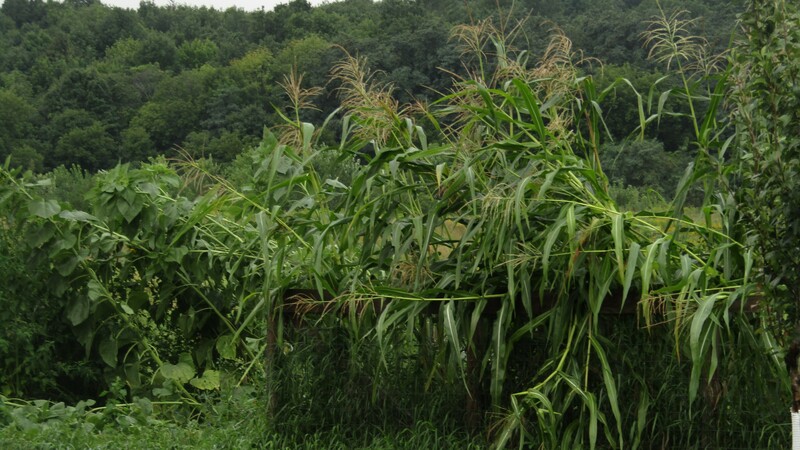 We’ve probably used around 20 ears of corn, and there is more that needs to be harvested and preserved in the next couple of days. I’ve harvested a bunch of parsley and oregano, and a ton of black beans. So far, we’ve shelled about 1/3 of a gallon(?) and have at least that much more in the house waiting to be shelled. Scott, Pumpkin, and Doodles picked all of the peaches over the weekend, and I canned 12 pints and 3 quarts of Honey-Spiced Peaches and 3 quarts of Peaches in honey syrup. I’ve also made a few jars of jelly in grape, peach, and cherry (9 or 10 jars in total). I dice my bell peppers and freeze in a single layer on a jelly roll pan. When they are frozen, I break them off of the pan, and break them apart and put in a zip-lock freezer bag. The jar on the right are purple pole beans (you can tell the water has a purple tint). The ones in the middle are cooked green beans. The ones on the right are green beans that have not yet been cooked but are being blanched in hot water while waiting to be transferred to the pressure canner. Tomatoes and oregano from the garden… I see spaghetti sauce in our future! One of the personal watermelons that we cut open. Some were more “red” than others, but we only had one that had a less than satisfactory taste. A pile of pole beans, a basket of sunflowers, and a table of kids enjoying fresh watermelon. Note to self: Don’t let them eat watermelon in the house anymore! Scott teaching Adam about bug holes in the peaches. Right now, we still have a lot of personal sized watermelons to harvest, as well as some larger varieties that still aren’t large enough. 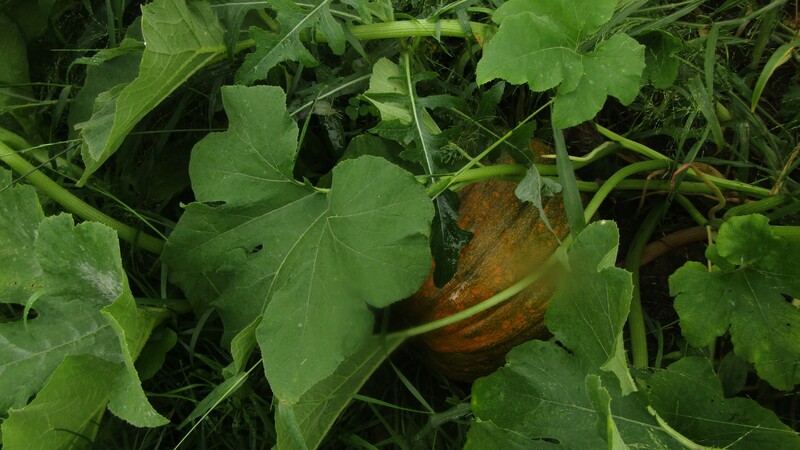 There is a patch of cantaloupe which should start having ripe melons any day now. There are still at least another 10 gallons of tomatoes coming out of the garden this year, though I’m hoping to get at least another 15, if not more. Two of our pepper plants are doing really well, and should probably provide us with at least another 1/2 gallon of peppers. The black beans are not done yet, and the green beans look like they might get another flush of beans. There is a whole patch of red cabbage, not quite ready to be picked. We’ll still get some more zucchini, though I might just pull the plants soon as I’m having a hard time getting around to shredding them, and I can only make so many “zapple pies” and zucchini gummies and use them fresh in so many dishes. I’m not sure how many pounds of potatoes we’ll be harvesting, but it looks like I’ve finally figured out how to grow them! Now I just need to figure out how to store them well. If I had to guess, we’ll get at least 100lbs. of potatoes out of the gardens! I may end up canning some potatoes for easy use in meals, but I mostly just love making mashed potatoes. The sunflowers have finally bloomed, but a lot of them got knocked over in the thunder storms we’ve been having recently, so they aren’t as noticeable as I had hoped. The pumpkins, however are finally showing themselves! I was a little worried about how our patch was doing. I didn’t have the time to deal with keeping weeds down, and since we had to take short-cuts in preparing the space, that meant we didn’t eliminate all of the weeds. I’m not sure what kind of a harvest we’ll get out of that, but it looks like we should have plenty of jack-o-lanterns, snowball pumpkins, and Cinderella pumpkins. My “big” pumpkins aren’t looking very big at all. I’m mostly hoping at this point that our butternut and acorn squash do well. No matter what, it looks like we’ll probably have at least some pumpkins to put in the produce stand! Speaking of the produce stand… It still isn’t finished. I need more boards off of the barn, but I need Scott to do that, and lately we just haven’t had the time for him to do much of anything around here that isn’t urgent maintenance. Too many other pressing things to deal with and too much uncooperative weather. I’m hoping we can do it really soon though, so I can finish it before the pumpkins are ready to go over there. Despite the fact that it is unfinished, I put a few watermelons out in the stand and put up a Facebook post to let people know I had some for sale. I need to make a sign for the road one of these days, though. I have one for pumpkins, but not for other stuff. I sold a few watermelons! (Thank you, if you purchased one!) I might start putting some other kinds of produce out there that is from our excess, but I’m putting up as much food for our needs as possible, first. Once I know we have enough of something, I’ll start putting other things out there. If you live in the area and would like some watermelons, let me know! We’ll have more soon, and we definitely cannot eat it all ourselves. 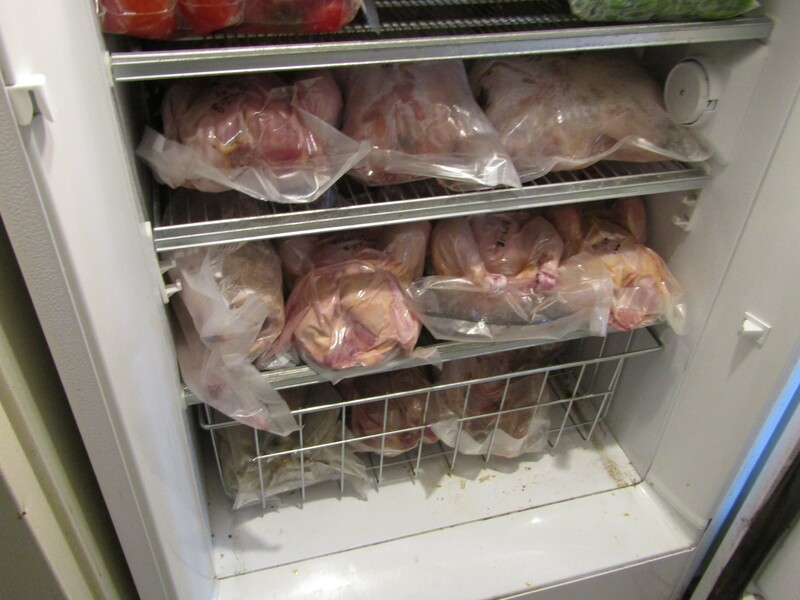 Last Monday, we butchered our meat chickens! That was a really good feeling in that it was the first thing that has come full circle that was directly affected by the fire. We lost all of our chicks in that fire and had to start over again in mid-June. We discovered after butchering that next year we’ll aim for 12-14 week window instead of the 9-10 we butchered ours at this year, because we like those chickens to be larger for when we want to cook a meal that is centered around a chicken dish. And last but not least, Scott harvested some honey over the weekend! It’s not much, just three frames, but he thinks he might be able to harvest more soon. He said there was a lot of comb filled that just wasn’t capped yet. Earlier this year, he did some experimenting with splitting hives and divided our 2 into a total of 4. When he went to check on them the other day, he said that 3 of the 4 hives are still alive and well. Now we just need to learn a lot about over-wintering really soon so that we hopefully have better luck with the bees over winter this year than we did last. No matter what, I’ll call this year a success. Could it have been better? Maybe. I’m not sure that there is a lot we could have done differently. But successfully splitting a hive and having honey to harvest… those are both a big deal! Our latest challenge has been working around the rain. Even getting out to walk Poppy is hard when it rains all of the time! Some of the recent storms have knocked over sunflowers and corn, and I’ve had some issues with unripe tomatoes splitting, but aside from that, it hasn’t hurt much, it’s just kept us from working outside for very long. Sorry for the lengthy post! I’ll try not to let it go so long between updates 🙂 How are your gardens doing? P.S. I thought I should mention that Pumpkin wanted to start his own blog. He’s put up one post so far, and has another one waiting to be written. Peanut is also asking to start a blog, so I’m gonna have to work on that sometime soon. I figure it will be a good source of learning… typing, computer skills, and English. If you would like to check it out, here’s the link 🙂 Adam’s Blog. If you visit, make sure you leave him a comment! Congratulations, Danielle! What wonderful news! Also, it’s wonderful that your garden has done so well this year even though you haven’t been able to spend much time tending it. Thank you, Kathi! And yes, I agree, it is wonderful that it is doing so well. Mulch makes a HUGE difference and allowed me to not have to worry about watering… it also makes weeding easier so that when I DO get out there, it’s not as bad as it could be! Please keep us posted as you learn more about overwintering hives. We have so much to learn. Reading about your summer was so nice. My youngest daughter recently moved to Wisconsin to work at Epic. I wonder if you are near her. I’ll try to remember! I probably will, since I’m going to need to keep a record of what we do! Do you keep bees, or are you planning on it? Epic, that’s in the Madison area, right? I’m about 2 to 2.5 hours northeast of there.